On Prudence Island in Narragansett Bay. Take the Brsitol-Prudence Is ferry to the island, then take Sandy Point off Narragansett Avenue, Prudence Island. The East Side Passage of Narragansett Bay was the major shipping channel to Newport Harbor, Bristol Harbor, and Providence. Seaport villages around these harbors developed as prosperous shipbuilding, fishing, and trading centers. Prudence Island Lighthouse was originally built in 1823 on Goat Island, in Newport, and served as the Goat Island Lighthouse until 1842, when it was discontinued. As shipping, whaling, and trade grew, along with tourism to the area, the main shipping channel of the East Passage is located near the shoreline of Prudence Island where petitions were made for a lighthouse to be built to guide mariners away from the dangerous shoals offshore and along Sandy Point. 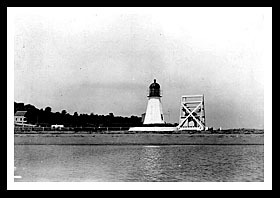 In 1852, the light at Goat Island was dismantled and moved to Prudence Island, where it became the current Prudence Island Lighthouse. It was reassembled at Sandy Point on the east side of the island with a wooden keeper's dwelling built near the light. 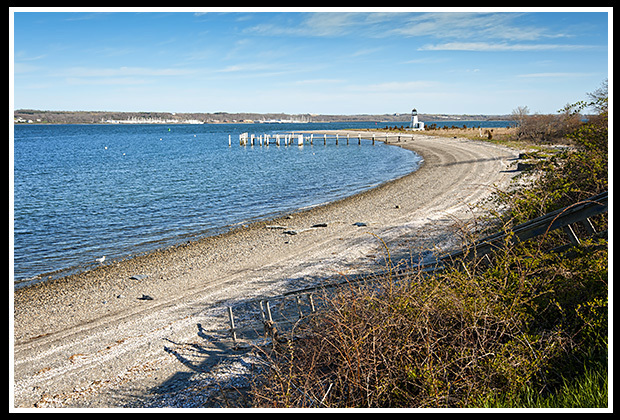 Prudence Island Lighthouse is commonly known as Sandy Point Lighthouse to the locals. In September of 1938, with hardly any warning, New England’s worst hurricane caused massive wind gusts and a huge tidal wave to come up the bay, destroying everything in its path. Three guests had arrived beforehand to visit the keeper at the lighthouse. They were Martin Thompson, a former Prudence Island Lighthouse keeper, James Lynch, and his wife Ellen who sought refuge under Keeper Gustavus' recommendations that the lighthouse was sturdy enough to survive the hurricane. The keeper's instincts turned out to be incorrect. Although he was able to make it to safety with the help of 18-year old George Taber, he had to watch in horror as his wife and son were swept away and drowned, along with their three guests. Only the tower survived the hurricane. 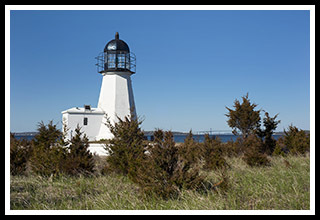 In August 2001, the Prudence Island Conservancy was given the contract to care for the light, after petitioning to have the contract instead of being given to the American Lighthouse Foundation in Maine, with the help of Congressman Patrick J. Kennedy. Prudence Island is a quiet island with tracts of land maintained by various conservationist organizations like the Prudence Conservancy to keep development to a minimum consisting of land primarily owned by the Rhode Island state park department, Audubon Society and various private foundations. There are two large reserves at each end of the island that are open to the public: the Narragansett Bay National Estuarine Sanctuary at the north end and South Prudence State Park, comprised of a closed 800 acre Navy base turned into a visitor center. Wildlife is abundant with the largest population of white tailed deer per square mile in the Northeast, and there are plenty of public docks for shoreline fishing. The main beach is about 1 1/2 miles long with a shallow sand bottom. There is rarely more than fifty people on the beach during the busy season, so no one gets in your way. There are two general stores on the island which measures about 7 miles long and 1 1/2 miles wide. Be wary that there are no public bathrooms on this quiet place. You are truly in a natural habitat. Access to the island is made by boat or by taking the Bristol - Prudence Island Ferry. It’s a mile walk to the lighthouse (bring plenty of bug repellent). Prudence Island can be reached via the Bristol - Prudence Island Ferry. Call (401) 253-9808 for the ferry schedule. The ferry landing is in Bristol. Take Route 195 East to the Barrington/RI 114 South Exit. Merge onto Route 114 South and travel to to Bristol. In Bristol, Route 114 is also named Hope Street. Turn Right onto Church Street and drive to the ferry landing at the Church Street Wharf. When you reach Prudence Island, from the ferry landing, go south on Narragansett Avenue for just under a mile. Turn left onto Landing Lane, where you will find the lighthouse. Their narrated lighthouse cruise covers 10 Rhode Island Lighthouses in Narragansett Bay along with a complete Newport Harbor Tour. Special organization for lighthouse and coastal preservation provides Ultimate Lighthouse Tour, Northern Bay Lighthouse Tour, Southern Bay Lighthouse Tour, and Providence Sunset Lighthouse Cruise on specific days during the summer. Tours may include stopovers to tour inside lighthouse. 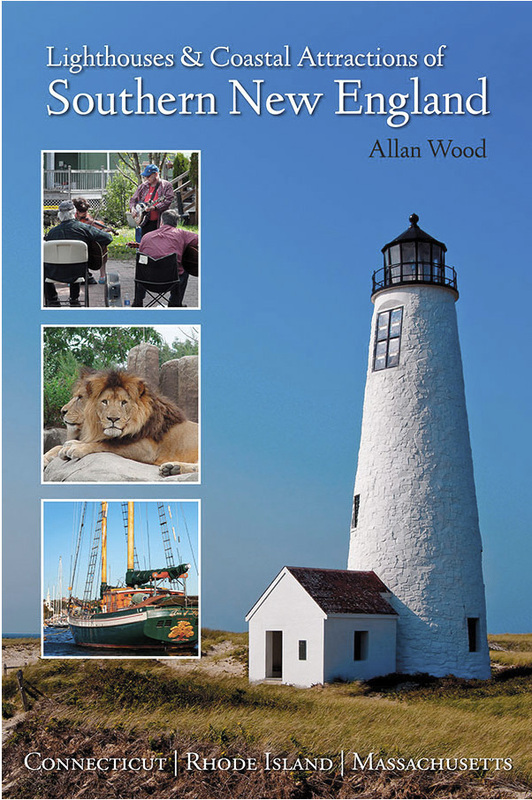 My 300-page book, Lighthouses and Coastal Attractions of Southern New England: Connecticut, Rhode Island, and Massachusetts, provides special human interest stories from each of the 92 lighthouses, along with plenty of indoor and outdoor coastal attractions you can explore, and tours. You'll find more accounts of the Hurricane of 1938 and it's effects on lighthouses and light keepers on Narragansett Bay.